Noblesse oblige-this has been true for more than 50 years. The cult brand and the "Made in Germany" cars have stood for the perfect balance of power and elegance-and rightly so: about 70 percent of all Porsches ever built are still on the road today, and to this day, all the generations of those striking cars are still eye-catchers in the streets of the world. The small co Noblesse oblige-this has been true for more than 50 years. The cult brand and the "Made in Germany" cars have stood for the perfect balance of power and elegance-and rightly so: about 70 percent of all Porsches ever built are still on the road today, and to this day, all the generations of those striking cars are still eye-catchers in the streets of the world. The small corporation has been defending its pole position with a great sense of quality and passion. They do not build sports cars in order to win races; rather, they participate in races in order to improve their sports cars. Porsche has won the world's toughest race, the 24 Hours of Le Mans, more often than any other manufacturer. 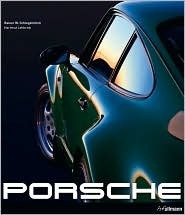 This book portrays both Porsche's unique success stories in the motor sports arena and their boldly innovative design and style. The plentiful high-quality illustrations by renowned photographer Rainer W. Schlegelmilch and the informative texts by Hartmut Lehbrink will fascinate any fan of cars and motor sports.